If Manchester United’s will to sign Samuel Umtiti has been genuine, and not just imagined up to help the defender get better terms with Barcelona, then the small chance they had of success may well be growing. In the aftermath of Barcelona’s defeat to AS Roma, and subsequent elimination from the Champions League, Umtiti has been especially criticised. Catalan newspaper Sport gave the 24 year old 2/10 and his performance was described as ‘inexplicable’ and ‘incomprehensible’. It wasn’t going to be left there. What had been a stance of ‘OMG, we can’t lose Umtiti, do something Barcelona’ has turned into ‘Just who does he think he is!’. In a Thursday article, Sport say talks to renew Umtiti’s contract have ‘slowed’ and ‘can be cooled further’ after the Roma match. ‘Sirens songs’ from Jose Mourinho and Manchester United are said to have been part motivation for Umtiti to demand a bumper new contract. It’s not only the money he’s asking for, but how Umtiti has gone about things which has caused annoyance. A recent appearance on France’s Telefoot did nothing to kill the rumours, with Umtiti dodging questions about staying at Barcelona and Manchester United interest. Sir Alex Ferguson being at the Roma-Barcelona match ‘didn’t go unnoticed’ and whilst the former Manchester United manager was apparently there at the invitation of a friend, Sport believe it’s a development in the growing circus. Barcelona officials are said to see Ferguson’s presence as a ‘new measure of pressure’. 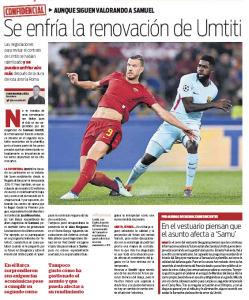 The reaction is to cool off renewal talks, to show the Frenchman that Barcelona won’t be bullied, and Sport add: ‘At Barça they continue to value the quality and projection of the French defender’s future, but they are disappointed with his strategy of asking for a contract improvement as soon as possible. Samuel Umtiti has a buyout clause of €60m, something else which is pressuring Barcelona because Manchester United and others would look kindly at the set fee. The Premier League club are said to have offered €9m per year after tax to Umtiti, and he wants his current side to match that offer of terms. With Barcelona backing away, the ball is in Umtiti’s court. If he’s so keen on that €9m then a move to a club, or the club, offering it could become more likely.